Goldman Sachs may get lost on Main Street. The investment banking powerhouse plans to meander off Wall Street and start lending money to average Joes and Joannes next year, the New York Times reported on Monday. Healthy returns probably await. A broader constituency of customers also could come in handy. It’s a big strategic change, however, and one fraught with distractions and risks. The bank run by Lloyd Blankfein, with its $860 billion balance sheet, is considering making personal loans of up to $20,000. Goldman also may extend the service to small businesses. Both are potentially ripe opportunities. Traditional lenders are gun-shy these days and have left big swaths of borrowers behind. Helping people refinance credit card debt at a lower rate, for example, is potentially a $400 billion market. That’s why a number of newer companies are jumping in, from online matchmakers like LendingClub to internet-based lenders such as Affirm. These areas can be plenty profitable. OneMain Financial, the subprime lender Citigroup recently sold to Springleaf Financial, generated a return on assets last year of 6.7 percent, or almost seven times more than most big banks can manage. Building better technology is a big advantage, too. It can obviate the need for branches, which keeps costs low. It also has the power to make things go much faster for customers. Bond Street, for example, which lends to small companies, has slashed its application and approval process to two days, against two months at traditional banks. 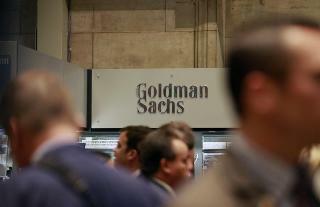 For Goldman, there may be one other significant element of the endeavor. Its public image arguably suffered during the last crisis because it is exclusively a wholesale bank, with virtually no sizable, public constituency with a vested interest in its survival. One of Blankfein’s bets may be that building a base of everyday consumers could help change that next time around. It’s a business that can be punishing in a downturn, however. OneMain sold for just 7.7 times earnings. Goldman also would be inviting still more oversight, this time from the Consumer Financial Protection Bureau. And the business is unlikely to be big: OneMain’s $10 billion of loans may yield just under $600 million this year, little more than 6 percent of Goldman’s bottom line. Goldman may not find Main Street as welcoming as Wall Street. The Goldman Sachs stall on the floor of the New York Stock Exchange. Thruppence: Can Snapchat unmask dodgy borrowers? Goldman Sachs is preparing to offer loans to consumers using an electronic platform, the New York Times reported on June 15. The bank would initially fund the loans with certificates of deposit and in the future would consider securitization. Goldman is likely to start by lending up to $20,000 to consumers. It may later branch out into small business loans. In May, Goldman hired Harit Talwar, formerly president of U.S. cards at Discover. In the internal memo announcing his appointment, obtained by the New York Times, Chief Executive Lloyd Blankfein and President Gary Cohn noted that “the traditional means by which financial services are delivered to consumers and small businesses is being fundamentally reshaped” by technology and the use of data and analytics.